One of Cherry Mobile‘s newest devices is the Omega Lite 4, a 5-inch device that sports an 18:9 aspect ratio display, entry-level hardware, and Android Go on board. Is it good enough to become one’s first Android phone? Here is our full review. The Omega Lite 4, as you would expect from entry-level phones, offers a rather basic all-polycarbonate smartphone design. At the front sits the 5-inch 18:9 aspect ratio screen, the call speaker grille, a couple of sensors, notification light, and a five-megapixel rear camera. The top and bottom bezels seem to be thick compared to its sides, and this may help in playing games or navigating in landscape mode. The right side has the volume keys and the power/lock button. At the top are the microUSB and 3.5mm audio ports, while speaker grilles dominate the bottom part. Turn the device into its back and we have the eight-megapixel rear camera with LED Flash set up at the upper right a la iPhone X. The backplate, in black, has more of a matte finish and is prone to smudges and grime. Two iPhone-like lines at the top and bottom areas extend towards the sides for more aesthetic appeal. Prying open the device reveals slots for the removable battery, as well as two nano SIM cards and a microSD card slot. The phone is light to hold and is quite a joy to use with one-hand. Since the aspect ratio makes you feel you’re holding a smaller 4.5-inch device, you’re able to reach all areas of the display. It’s also great to carry around and use for a long time without straining your wrist. A five-inch LCD display with an FWVGA+ resolution resonates to a respectable 214 pixels per inch. The colors are good, its brightness decent for daily indoor and outdoor use, and is good to view on most angles. Square panels may be noticeable but aren’t much of a concern. The device can for personal multimedia consumption. While it seems to offer dual speakers with its setup, only the right speaker grille emits sound and the microphone in at the left side. The loudspeaker isn’t much noting as it’s at the right levels alongside other entry-level devices. Its packed earphones are performing, but we’d always recommend using your ear gear of preference for a better audio experience. The Omega Lite 4 is one of Cherry Mobile’s first devices this year to have Google’s lighter Android Go mobile operating system based on Oreo. It touts lighter and better performance with the use of Lite or Go apps, as well as added functions that would be beneficial for smartphones with measly storage and RAM. The OS feels fluid, smart to navigate to, and it feels like you’ve never left the original Android platform save for a few added enhancements such as data and battery savers. As checked, the device has 5.19GB of 8GB internal storage left after considering all default apps installed such as Google’s slew of Go apps, an old-time Gallery app, and Cherry’s Movie Club. Being an Android Go device, the Play store suggests to download Go-compatible apps, but you can technically download any other app available in the Play Store unless deemed as incompatible with your phone. Equipped with a MediaTek MT6580 Chip and 1GB of RAM, you’d expect phones like this to feel sluggish with lots of apps running on the background. By using lite apps, instead, the phone was able to still maintain a decent level of usability such as switching between apps and playing casual games, with warm heat up at the upper-back part. Too bad that there are only limited ones, so you may have the need to download full-stacked versions of those without lighter counterparts. Calls made with the Omega Lite 4 were decent as the call speaker is loud enough to be heard in outside environments, while you may need to do a double take with speaking with the phone’s microphone during calls. Other connectivity options work decently — there’s only 3G here but it’s quite good when used in good-signal locations, the GPS may be off at some point but is deemed working and usable. The biggest tradeoff, perhaps, is its battery life. We were at least expecting a decent performance with a 2,000mAh battery noting that this is an unaltered version of Android Go. Too bad to know that this one only lasted for around 14 hours of no data usage, while turning on WiFi and mobile data at some points in time, not to mention the use of resource-hungry apps, reduces its life to just around 6 hours of light to moderate usage. Our PCMark 2.0 battery test gave this device 4 hours and 13 minutes score, while our standard video loop test only reached 6 hours and 22 minutes. In a sea of smartphones that rock measly hardware and optimized software, Cherry Mobile’s Omega Lite 4 stands out as a decent device that can compete with other 18:9 display phones such as the Cloudfone Thrill Boost 3 and the myPhone myX1. For a Php2,999/$57 price tag, this is actually decent-performing as it sports a lighter Android Oreo out of the box, not to mention its respectable, compact build, and the fact that it’s actually shipped with pure Android Go right out of the box. Tradeoffs had to be made with such an affordable price, and it reflected in a somewhat surprisingly measly battery life that could be a problem in the long run especially when you load this phone with more apps that run in the background. Future updates, too, remain a question as this device getting an Android Pie Go update is up in the air. A grand more and you’d get the Flare S6 with a far decent power to last perhaps a whole day. 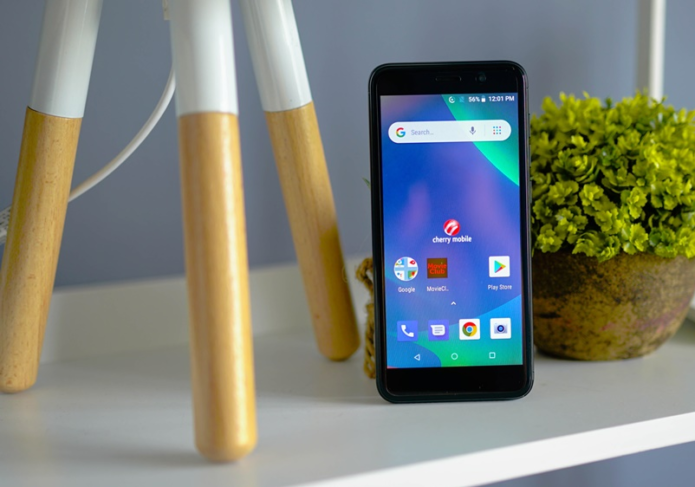 Nonetheless, the Omega Lite 4 is a good device worthy for first-time users who want a pure, unadulterated version of Android Go.